In the 6 weeks since the launch of All Slots` new mobile casino app for Android devices, there have already seen great take-up and activity on this platform. With the increasing popularity of Android smartphones and tablets, this comes as no surprise, and this mobile casino app is truly superior to what was previously available, with amazing graphics and full sound effects. The Android mobile casino application has a user-friendly interface, which is similar to the Microgaming`s Viper casino in how the games are launched via a central lobby. The games download to the device automatically via 3G or Wi-Fi, for added convenience. If you have not already seen it, be sure to check it out today, and try playing the new games. All Slots Mobile Casino for Android has already welcomed its first new game since the launch: Bonus Deuces Wild Video Poker. This game is very popular on the online casino, with its big bonus jackpots for special hands. And as Deuces are Wild, players have the unique chance to win a hand with 5 of a kind. 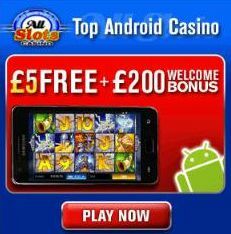 All Slots Casino has introduced a new $5 free bonus upon registration for new mobile players. This offer has proven to be very popular and in part because of this offer, an increase of 1100% in the number of players wagering on their mobile devices in the first quarter of 2012 (compared to the first quarter of 2011) was seen. This $5 free bonus is in addition to the base $200 Welcome Bonus (a 100% match on the player`s first deposit up to $200) and is designed to improve download-to-play conversion by giving the player a taste of the casino excitement even before he`s made his first deposit.